Pune: Delivering Change Forum, which aims at providing a platform for those who can bring about a positive transformation in society, is set to conduct a two-day international conference at Nehru Centre in Mumbai on January 24 and 25. This conference is being organised by Sakal Media Group, Delivering Change Foundation, along with the government of Maharashtra and various well-known institutions from across the world. The conference will be inaugurated by Chief Minister Devendra Fadnavis. All the dignitaries participating in this conference, including experts from various countries and well-known personalities working in different sectors from across India would in the future work towards transforming Maharashtra. 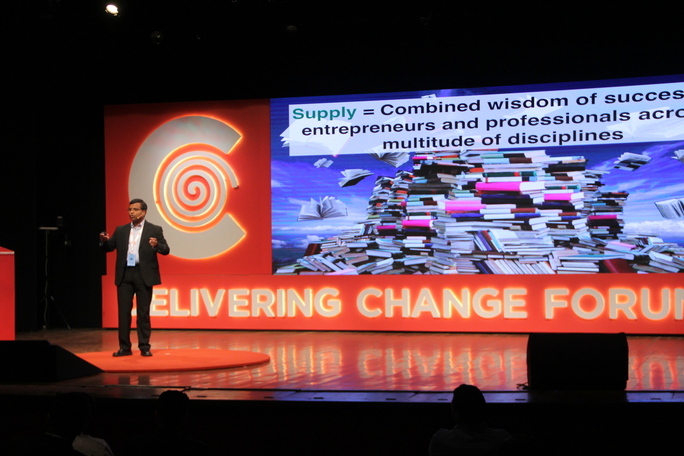 Abhijit Pawar, Founder and Chairman, Delivering Change Foundation, will deliver the keynote address. The conference will see speakers from across the world share their experiences, ideas and innovations about bringing about a change in society. The speakers will focus on how existing resources can be used more effectively while bringing about a transformation. The experts have shown keen interest in actually working for start-ups, businesses in other sectors, industrial training, smart cities and villages, investment required for the same, skills that would be useful in the future and need of science and technology for bringing about a positive change in the State. All these experts are hence going to be associated with Maharashtra through Sakal’s Delivering Change Foundation. The conference also aims at initiating a discussion which can analyse the needs and challenges of a changing society and suggest solutions for the same. Groups would be formed that would consist of well-known people from different economic and social communities and their participation would be ensured to bring about a positive change at all levels of the society. For this, Sakal Media Group has selected 16 sectors including education, farming, rural development, infrastructure and industry among others. The conference will see participation of Dato Sri Idris Jala, CEO of the Performance Management and Delivery Unit (PEMANDU), the Prime Minister’s office, Government of Malaysia; Eytan Stibbe, Founding Partner Vital Capital; Esteban Gomez Nadal, Global Brand Director, Palladium, a leading consulting firm in the Impact and Development field; Prof Peter Weibel, Chairman and CEO, ZKM, a leading German Institute in Media and Art; Prof Uriel Reichman, Founder and President of IDC Herzliya; Frank Juergen Richter, Chairman, Horasis who is working towards sustainable future; Prof Peter Sloterdijk, Philosopher and Author; Eyal Gever, Programmer and 3D Sculpture Artist; Gesche Joost, Professor for Design Research at the Berlin University of the Art; Eric Zimmerman, Director of Research and Global Engagement at IDC Herzliya; Christiane Riedel, Managing Director, ZKM Karlsruhe; Peter Vanderwal, Strategic Growth and Innovative Development Financing Lead at Palladium; Petra Olschowski, State Secretary, Ministry of Science, Research and Arts, Baden-Württemberg, Germany; Joshua Caleb Collins, Founder and CEO of Catapult Ideas, a business incubator that aims to source the world’s best high school entrepreneurs; Anthony Farr, CEO at Allan Gray Orbis Foundation; Zohar Sharon, Chief Knowledge Officer, Tel Aviv municipality, Israel; Shaul Avidov, Founder and CEO, Musketeer. There are many more participants from different fields. Their names will be declared soon.